Mobile application, which indicates to the user what public transport options are available at any time for a particular route. For instance, it suggests options such as electric car sharing, buses, the nearest public bike rental station, available parking spaces, etc. 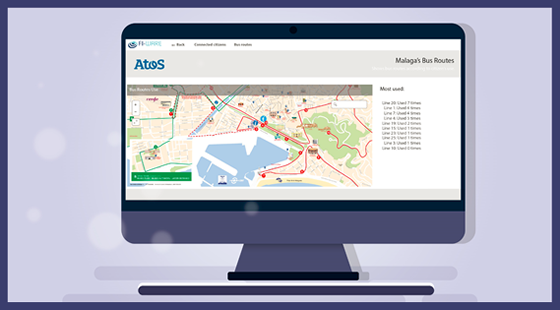 Everything is managed in real time to obtain an optimal route based on data provided by the sensor network and open data from the city. Web-based dashboard for the city municipality control center, which allows civil servants to visualize all the data coming from the city sensors network to support everyday decision making and evidence-informed analysis to improve the traffic planning in the city in times of high tourist's flows, sport events, among others. to use Open data to serve people! We are part of Atos Research & Innovation in Atos Spain. CityGO is part of the FIWARE Marketplace! Discover more here. The CityGO application has been developed in the context of a project funded within the ERA-Net Urban Europe Joint Programming Initiative (JPI) with support from the Spanish funding agency CDTI, and the Framework Program for Research and Innovation of the European Union "Horizon 2020", under grant agreement no. 646453.